It's pretty hot in Mumbai right now and to counter the heat I am trying to eat at home as much as possible as I am more in control of what I eat there. I've fallen ill a few times while eating out this summer including in Lucknow and in Kolkata apart from in Mumbai. I think my body is unable to take in spicy food in this heat. I have tried to reduce the amount of red meat in my diet and am trying to stuck to vegetables and fish and chicken when I can. I am cutting down on the amount of chilli and oil in my food and am instead trying to extract flavours from things such ginger, garlic, cumin and turmeric, Mediterranean spices like zatar and dukkah and so on. I am also eating lots and lots of curds and yogurt and it seemed that I had reached the right place when we stopped at the Parsi Dairy Farm during the Dhobi Talao Parsi Trail which I conducted for SodaBottleOpenerWala a couple of weekends back. It was a typically hot and humid Mumbai summer morning that day and though the walk was short, I felt like I was playing a football match in the blazing sun. You can blame my spoilt, air-conditioning seeking, existence for that. The moment we walked into the Parsi Dairy Farm outlet it seemed that I had walked into an air-conditioned Indian Railways train compartment. It was cool. Delightfully cool. The decor was blue, white and grey and a throwback to train rides that I took from Mumbai to Kolkata in the Howrah Mail and in the Geetanjali Express at the start of the career. As was the neon glow of the sterile bright white tube lights there. I ordered lassis for our intrepid group on the trail, and for those wary of sugar, butter milk or chhaas. Parsi Dairy is known for both though their specialty, as Freddy mama pointed out, is white butter and ghee. You do get some of these products and their kulfi on modern retail outlets such as the Godrej Nature's Basket in Mumbai too. SodaBottleOpenerWala offer Parsi Dairy kulfis in their restaurants across India. The PDF lassi is chilled and is thick to a near ice cream-like consistency! Ice cream and not 'frozen dessert' of course as the Parsi Dairy Farm is all about great milk and milk products. This near 100 year old dairy outfit once supplied milk to large parts of South Mumbai according to what I read up on the internet. Now its presence has been eclipsed to a pale shadow of what it once was. The family that founded it still nurtures it though there were reports recently of their thinking of closing down the business. There was a lady sitting at the counter who said her father had started the place. With typical Parsi diffidence, and Parsis swing across both extremes and can be very boisterous too, she said that she doesn't play much of a role in the outfit. There were almond macarons and tea cakes for sale on the table beside her and she said that she makes these. Despite her humility, I am pretty sure that her involvement and being at the shop has played a role in sweetening the experience at the outlet. The staff was very warm and courteous. They didn't talk much but seemed to take pride in where they worked and wanted all who came in to leave happy and satisfied with the products on offer. They patiently took our orders for lassis, buttermilks and masala milks and then made sure that they we were well refreshed. They smiled when they saw us smile with joy after the tastings. Parsi Dairy Farm has sweets on offer. Like every sweet shop in Mumbai, they have their version of 'Bengali', read chhena based, sweets. They also offer traditional Parsi sweets and we ordered some of them. The staff most dextrously and patiently cut out tasting portions for our groups from what we had ordered. 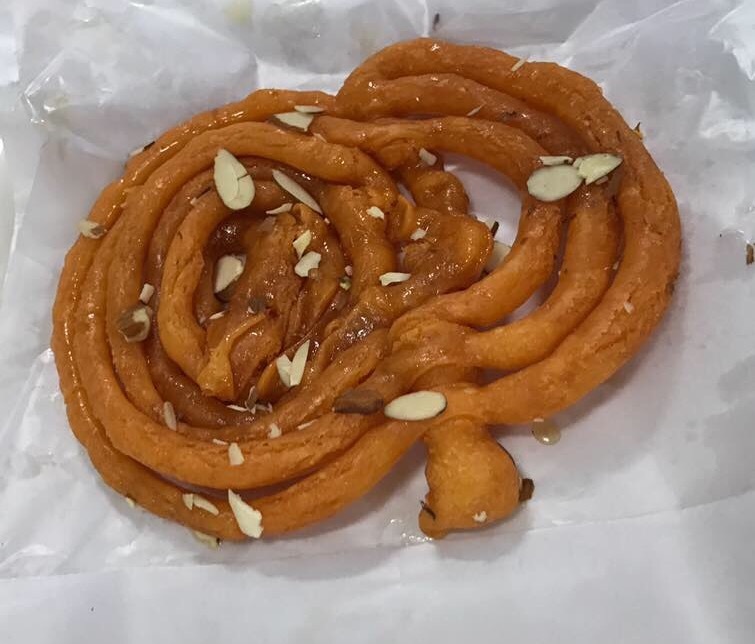 I asked for the thick deep red (occasionally orange too) thick and gargantuan jalebis that the Bawi (Parsi lady) at home loves. 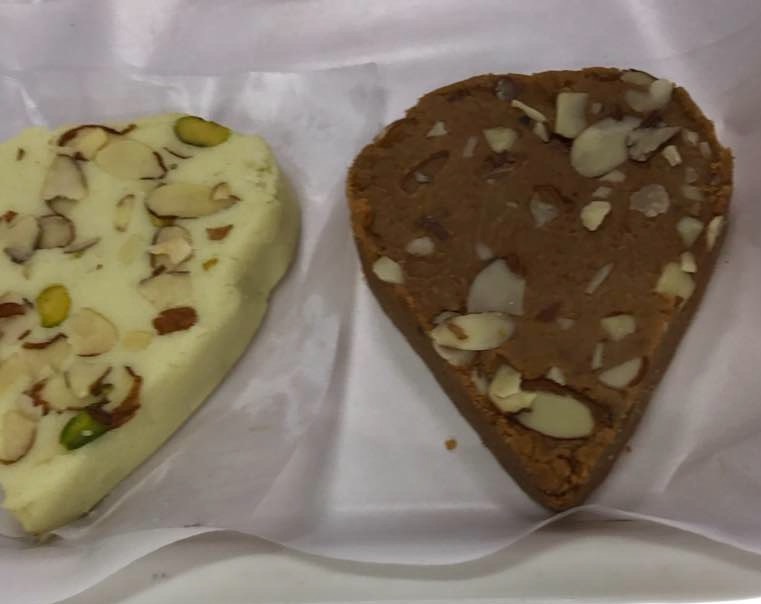 K's dad used to get it for her from Damodar Sweets in Dadar. There's a shop called Lookmanji which has its share of jalebi fans among the Parsis. We tried out some sutarfeni too. This is an amazingly intricate sweet made with thin strands (sutar) of sugary goodness. I also saw the fish shaped mava nu boi, the fish shaped sweet that Parsis give to each other on auspicious occasions. Another Parsi favourite that we tried is the malai khaaja. 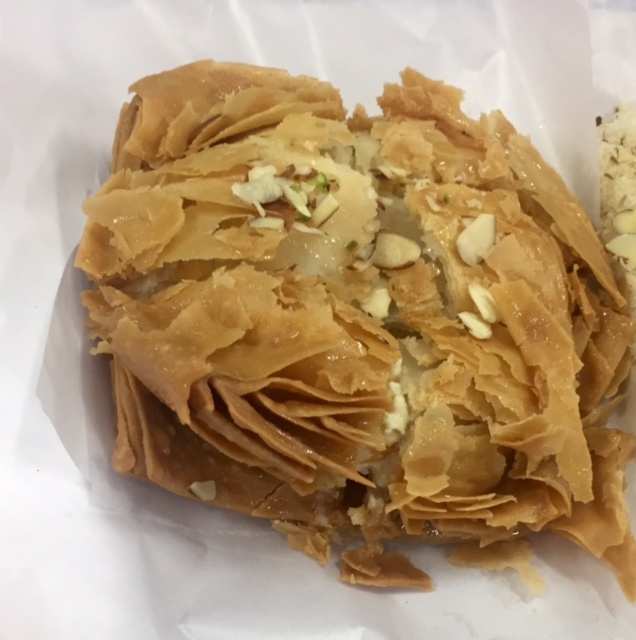 It has a refined flour based crunchy deep fried sugar soaked flaky pastry crust which throwback to it's Middle Eastern cousins such as baclava and kanafe. 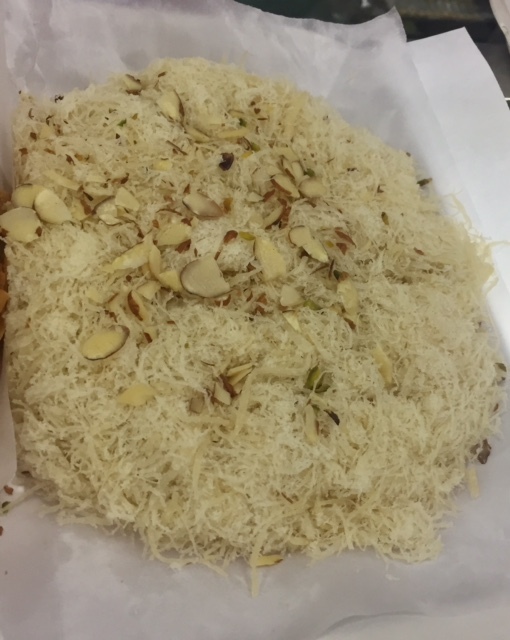 Enshrouded in it is a chilled rabri like reduced milk filling. The textural contrast of th ecrust (khaaja) and the chilled malai/ rabri inside made this the perfect summer afternoon treat. Malai khaja is a speciality of Bohri sweets shops too and you will find them at places such as Shabbir's Tawakkal Sweets at Bohri Mohalla and possibly Noor Sweets too. Freddy mama, my wife's mama or my mama shoshur as we Bengali's say, recommended a sweet called barela peda which a sort of semi baked Parsi sweet from what I understood. There was something very charming and calming about our Parsi Dairy farm experience and no, it was not just the air conditioning that I am talking about! Folklore said that the Parsis, when they came to India, had promised the local king to be like a cup of sugar which sweetens a bowl of milk without being visible. The warmth and good vibes at the Parsi Dairy Farm is a beautiful example of their keeping to this promise. In case you have read my earlier post on the Paris Bakery, which we went to before the Parsi Dairy Farm in the Dhobi Talao Parsi trail, then you would know that it was a favourite of our Jamshed uncle and a recommendation by him. According to a comment on the post by his nephew in law Hoshedar, Parsi Dairy Farm too was a favourite of Jamshed uncle. Thank you Kalyan. You made my day. I am glad you enjoyed Paris bakery. It is one of the few gems of South Bombay. Did you know one more thing that J uncle liked? It was Malai Khaja from Parsi Dairy or Lookmanjis. So include Parsi Dairy on your next Dhobi Talao trail if you have not already covered it. That is another institution altogether. Good luck. Maybe I should call my Dhobi Talao walk the Jamshed Adrianvala Walk in the future!